Our course allowed us to take part in the NottForgotten competition.Our project was to design and propose different parts of Nottingham to restore and regenerate, all with a consideration to bring the community together. "I was interested in studying at NTU as there is a student friendly environment both on campus and throughout Nottingham city. 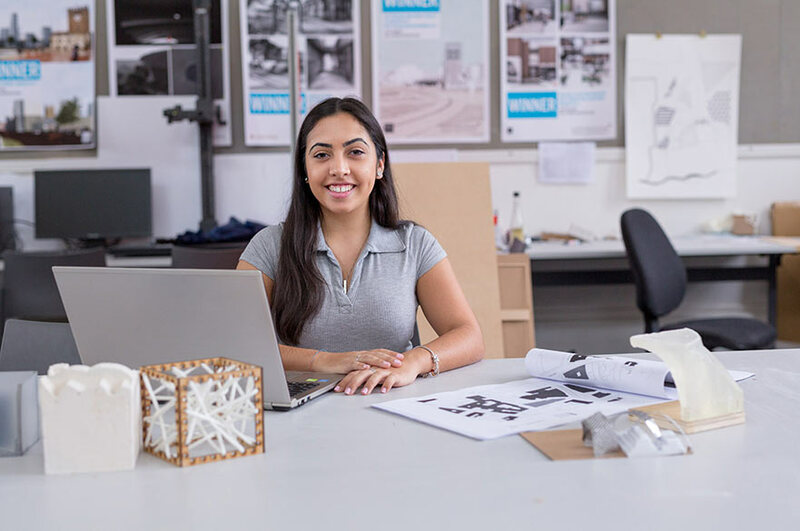 Additionally, my course at NTU is certified by the RIBA and ARB, it has high rates of employment that illustrates its success, and the course staff are really helpful and supportive. "NTU also offer students support through a variety of different departments such as the employability team who can help check your CV and cover letter, whilst the Student Services team can help with any worries you may have during your time at the University. "The course prepares us for not only individual projects but also group-led projects, the group work element reflects the type of environments I will work in when I go into practice. Tell us about any live projects, briefs or industry competitions you’ve been involved in through the course? "During Year One, I worked on a live brief which was based in Sneinton. We were asked to make a building that could function as an eco-house, a classroom, a storage room and a conference room all in one. The requirement for the building was to be eco-friendly and could be achieved using renewable sources. Part of our research was to look at precedents and find a way in how we could make the building sustainable. "During Year Two, our course allowed us to take part in the NottForgotten competition as individuals. Our project was to design and propose different parts of Nottingham to restore and regenerate, all with a consideration to bring the community together. Once submitted, some people within the class were short-listed and some even became finalists. It was an exciting competition to participate in. Has the course included any interesting speakers / lecturers from industry? "During Year One, every week there were guest lecturers from industry who would talk to us about their projects and ethos. It’s interesting to see how different architects work, and it’s through these lectures that I discovered my interest in sustainable architecture. Can you tell us about any work placements you’ve had? "I completed a work placement during Year Two at Phelan Architects in London, and through working on current projects that they were undertaking with clients. I worked extensively on Photoshop which helped me to develop my skills in the software. This was mainly used when rendering, to help the client visualise the maps for projects. "To have fun with projects above all and to challenge themselves as that is the way they will learn more about how materials can be used."